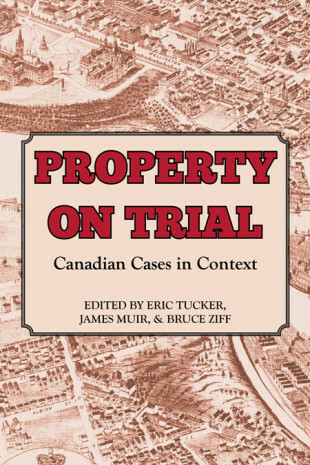 edited by Eric Tucker, Professor, Osgoode Hall Law School, Bruze Ziff and James Muir, Professors, University of Alberta Law School. Published with Irwin Law, 2012. Despite the huge strides made by Canadian legal history in recent decades, we do not know as much as we should about the law of property, a crucial aspect of most peoples’ engagement with the law, past and present. The Osgoode Society is thus especially pleased to publish this volume, which deals with topics as varied as the Newfoundland seal hunt in the nineteenth century to the modern Vancouver planning process. Some cases are well known, such as the Murdoch family property controversy, others less so, but the overall scope is very broad – Quebec nuisance law, restrictive covenants, pollution control, rental housing and human rights, picketing, taking by economic regulation, the theft of information, and land use regulation. The authors employ the detailed case study approach, allowing them to investigate not only the development of legal doctrine in particular contexts, but also to show the effect on the legal process of litigants’ determination, lawyering skills, the broader political and social environment, and judicial attitudes.